I could swear I had posted here about how I got engaged, but searching for it today, I couldn’t find a thing. Karl had asked for my family’s blessing back in January when we were in Rio. 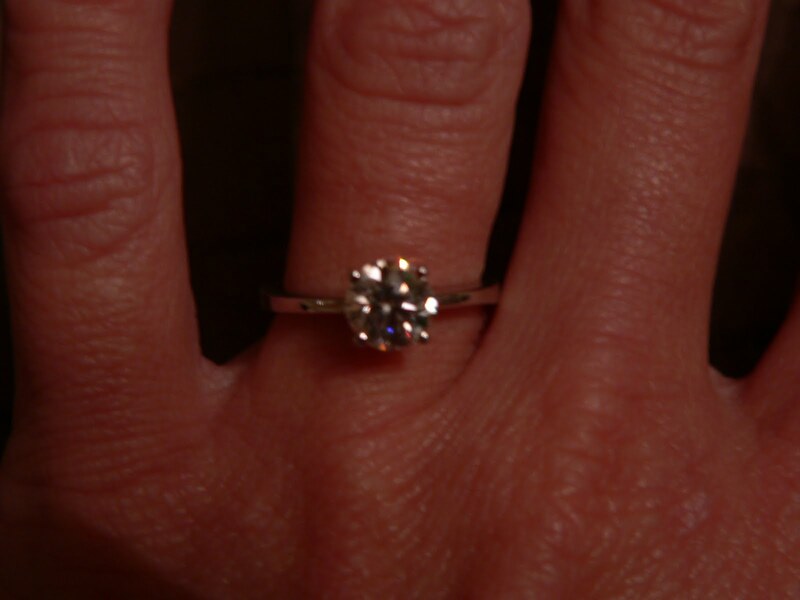 My family considered us engaged already (as my dad put it “he did the most important part, which was asking me, asking you is just a formality”), and we had talked on possible dates, but there was still no ring in sight. We had a trip planned to Seattle in February, where I was finally going to meet his family. We were supposed to leave on Wednesday night after work, but another snow storm was scheduled to start early on Tuesday, so we quickly contacted our bosses (our offices were closed on Monday due to snow), and changed our flights to Tuesday very early morning. Best decision yet, as by the time we landed in Seattle, the snow had already started in DC. Both our offices were closed most of the week, only reopening on Friday — we only used up one vacation day! I arrived in Seattle on Tuesday afternoon, after the snow storm that was coming to DC forced us to change our travel plans and leave town almost two days early. On Thursday, Karl took me out to a fancy dinner at the top of the Space Needle. Dinner was good, we stuffed our faces, even ate dessert. And he reads off from the card, I’m so nervous. I interrupt him twice to give him a peck on the lips. His words are sweet, they are bringing tears to my eyes. He finishes what he has to say and stands up. I stand up. I hug him. He kneels down, I sit down. He tells me to get up. There, in one knee, he asks me to marry him. I say “yes, of course” as I wipe tears off my eyes. We finish the bottle, and join his sister and husband at a K’s Choice concert (I had never heard of them, but they’re pretty good!). The waiter comes over with gorgeous flowers. Then comes back with a yummy dessert (the second dessert of the night, ooops) and in chocolate syrup “No Take Backs” is scribbled on the plate. I was so afraid that because I knew the proposal was coming, it wouldn’t be special… But it was perfect. I wouldn’t change a thing. It’s sparkly. And perfect. And just right. I will be marrying the “pretty boy” I met one day at a dive bar karaoke. When people say you never know when you’ll meet the one, they truly mean it. It was a long way here, with lots of bad dates and wrong guys. But waiting for the right one? Totally worth it. Aw, that is so sweet! I love that another couple in the restaurant sent over a bottle of Dom Perrignon (!). I know! We even checked out the price for it later and it was $195!! Probably the only time in my life I’ll drink Dom Perrignon! Haha, Karl was totally nervous too! He knew I’d say yes, but you could still see him shaking. I think he was afraid he’d mess up… Too cute! Oooh! I got all goosebumpy reading this, how awesome!! I love your ring, so classic! And how sweet your table-neighbors were to send you champagne! I liked the ring he picked too — simple, but classic. And the champagne was awesome! I know that it’s absolutely none of my business, but I totally want to know what he wrote on that card. Such a lovely proposal, and a lovely couple. Lovely, lovely, lovely. That’s hilarious! I have it at home, which is nice, because I get to remember the proposal. It was mainly talking about the year we’ve known each other, and our future together. It was pretty obvious in a “OMG, this is it! This is it! I think he’s proposing!” moment!